You’ve probably heard time and time again that content marketing is important in growing your business’s online presence. When done correctly, it can increase brand awareness, advocacy, and lead to more sales. 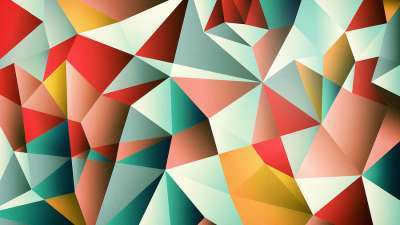 The problem is many businesses are doing it wrong. Many business owners think they need to be creating X new pieces of content per week, which simply isn’t true. Producing content for the sake of producing content is not a productive use of time and will not rank you higher in Google or drive more sales. Sure the more quality content you can create, the more traffic you will drive to your website. 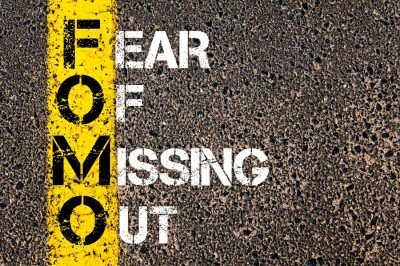 But instead of focusing on quality, many businesses will push out less than average content to stick to some arbitrary publishing schedule. Instead of posting every day or every week, you should post when you have an interesting, well-researched, and excellent piece of content to share. If you are struggling to come up with content ideas, you’re not alone. Producing creative content ideas on a consistent basis is a difficult undertaking, but not impossible. Local content is a very underutilized type of content that you can add to your content marketing repertoire. Local content can be informative blog posts, infographics, videos, guides, or any type of content that targets an individual location. Many businesses have regions and cities where they have a high density of potential customers. Creating local content and layering this onto an existing marketing strategy can be extremely helpful in targeting these regional audiences. The goal of this post is to explain how local content can benefit your business and how to incorporate it as part of your content marketing strategy. If you want to start integrating local content into your marketing campaigns, you need to make sure it makes sense for your business. It really comes down to one question: would you advertise locally to acquire new customers? If yes, then you can utilize local content. If no, local content probably doesn’t make sense for you. Unless you are a local business, a local content marketing strategy should only be used in addition to your primary content strategy because of scalability. If your business is in 200+ cities, you aren’t going to want to create content for every one of those cities. You’re better off creating content that is relevant everywhere and then throwing in content pieces that target big cities here and there. Let’s say you’re a new startup that’s launching a snack delivery service app in Phoenix, Arizona, similar to Uber when they launched in San Francisco. Since your target audience is only in Phoenix, creating local content makes sense in this case. Aside from increasing brand awareness and advocacy, here are four reasons why you should consider local content creation. It’s no secret that backlinks are one of the most important organic ranking factors, but have you ever wondered why sites like Yelp rank so well in Google with almost zero page specific backlinks? 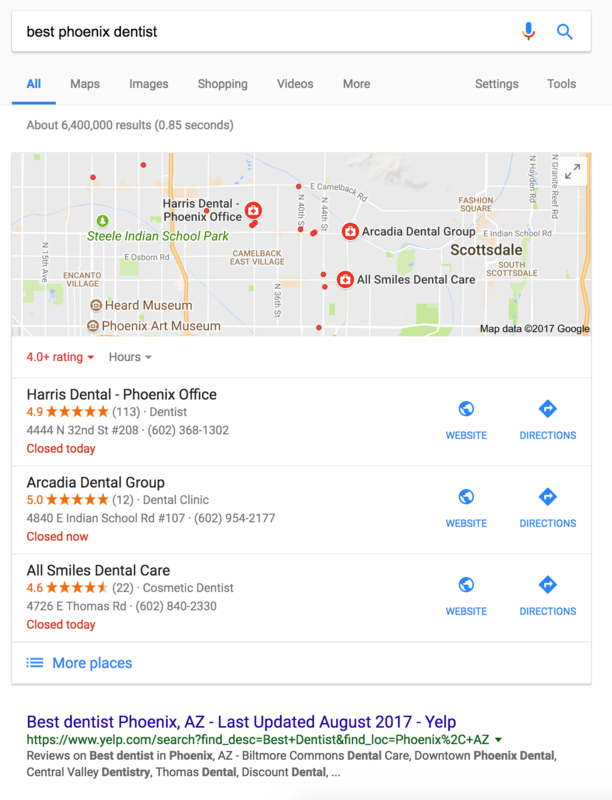 If you search for “best Phoenix dentist,” you’ll see that Yelp is the first organic listing. Open up the Ahrefs Site Explorer, enter Yelp’s URL that is ranking, and then look at the number of referring domains (i.e. URLs that link to that Yelp page). You’ll notice there is only one. This page is not ranking because of links pointing to it. The real reason it’s ranking is because of the power and trust coming from Yelp’s root domain. If you look at Yelp’s root domain in the Ahrefs Site Explorer, you’ll see there are over 500,000 referring domains! According to Moz, the quantity of inbound links to your domain from locally relevant domains is a significant ranking factor. Creating local content that attracts links will increase the overall authority of your domain and make ranking for other keywords easier in the future. These local links will help our Phoenix snack delivery startup rank for keywords in the Phoenix area. The strongest page on a local business’s website is usually the homepage because it has the most inbound links pointing to it. If you begin building and acquiring links to local content assets, these pages will also carry strength in them. Interlinking from your local content assets to your landing pages will pass link equity to your landing pages and help them rank. Since you’re a Phoenix startup that delivers snacks, let’s say you create a piece of content about how to stay cool in the Phoenix summer heat and have a section in the article about eating frozen treats. Let’s say you have a landing page on your website that you want to rank for “Phoenix snack delivery service.” To help this landing page rank, you could link from the frozen treats section of your content to your landing page. This method of internal linking works well because it’s much easier to build links to awesome and helpful content than to landing pages. Facebook advertising is a very effective way to drive new leads and traffic to your business and website. If you are a startup on a budget, Facebook advertising to a cold audience can get expensive. Retargeting is a method of advertising to people who have already been exposed to your brand. It is usually cheaper because the conversions rates on individuals familiar with your brand are typically higher than a cold audience. Here’s how you would use retargeting in conjunction with your local content. First, install the Facebook pixel on your website. The Facebook pixel allows you to capture the actions a visitor takes on your site and then provides you the ability to retarget them with Facebook ads. As someone lands on you local content, the Facebook pixel will fire. Now that is has fired, you know that person has viewed your content. In the Facebook Ads Manager, you can now target that visitor with FB ads. The beauty of retargeting is you aren’t advertising to a cold audience. You have already built some rapport with your readers (as long as your content was good), so they will likely be more receptive to your advertising efforts. To learn more about retargeting with Facebook, check out this guide. When a visitor lands on your website, you should try to capture that person’s email if you can qualify them as a potential customer. To weed out anyone who wouldn’t be interested in your product or service, you should have a lead magnet related to the product or service you are selling. For example, a free delivery coupon would be a great lead magnet for your Phoenix snack delivery service. On your local content, you should have a popup or section on the page that offers the free delivery coupon in exchange for the visitor’s name and email address. Now that you have their email, you can send them more information, promotional offers, and even retarget these people with FB advertisements. Here is a resource page containing some excellent guides on email marketing if you are interested in learning more. When looking for local content ideas with Buzzsumo, input the cities, counties, and state you are in to see what content has performed well. For example, we will type in Phoenix, Arizona. The results show two articles about flights getting canceled due to extreme heat. Now we know we can create content that plays off the heat residents of Arizona experience. Again, if you look through the results, you’ll find multiple articles using the Arizona summer heat as the basis for their content. Now that we know the summer heat is a popular topic in Arizona, it’s time to create some content around it. We want to make sure our content is optimized to go viral on social media. Generally, when someone shares something on social, the majority of their friends and followers are in the same region as them. If we can get people sharing our piece of content about the summer heat in Phoenix, the majority of people viewing and re-sharing the content will also be from Phoenix. If you can, you should also optimize your content to rank organically. When you have content ranking, you’ll receive a consistent, passive stream of traffic. To optimize for organic rankings, you will need to conduct some keyword research around the topic idea you are thinking about covering. Let’s say you want to create a piece of content on staying cool in the Phoenix summer heat. First, open up the Google Keyword Planner. 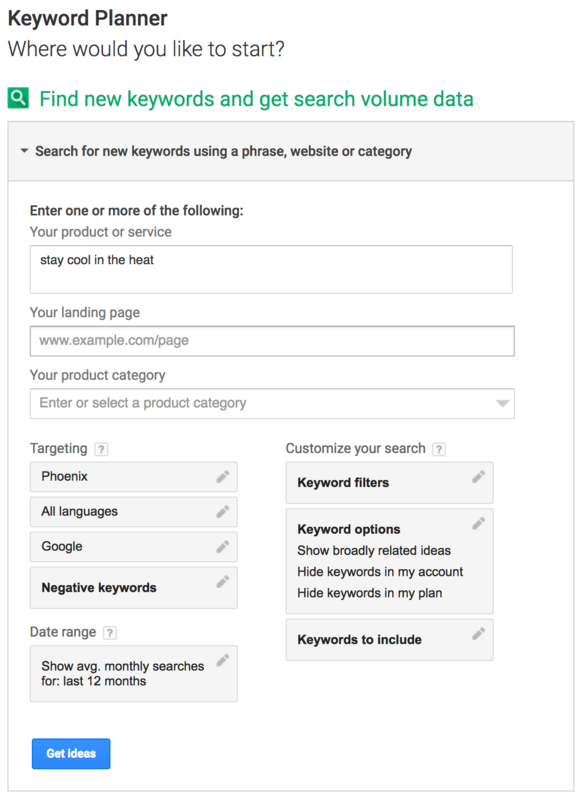 Select “Search for new keywords using a phrase, website, or category” and then type in “stay cool in the heat.” Under “Targeting” select Phoenix, Arizona as the location you want to target. The Google Keyword Planner is known to be inaccurate, so don’t worry about the exact search volumes. This simply validates that the term “staying cool in the heat” is searched by people in Phoenix. 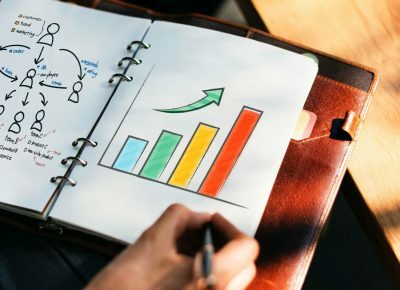 If you want to rank your local content organically, the Skyscraper Technique by Brian Dean of Backlinko provides a robust process to follow. Now that you have a piece of content targeting a particular location, it’s time to promote and rank it. There are some awesome resources out there for promoting and ranking content so we won’t be diving too deep into this. Social Media Outreach For Beginners: Finding social media pages, profiles, and groups to promote your content to is important in making your content visible. This post provides you with an outreach strategy for social promotion. 11 Effective Ways To Use Social Media To Promote Your Content: There are many ways to go about social media promotion. Your promotional strategies will vary depending on who your content is targeting and the type of content you are pushing. This resource will provide you with some different ideas. How To Learn SEO: To rank content, you will need to learn some search engine optimization. This resource will guide you to some of the best resources for learning the different pillars of SEO. Link Building For SEO: The Definitive Guide: Links are one of the most important elements in ranking. This resource dives pretty deep into building links through content marketing. Now that you have a process for finding, creating, and promoting local content, you should test to see the impact it can have on your business. The more successful local content you create, the more qualified visitors will end up landing on your website. If you capture these visitors emails and use retargeting with Facebook Ads, you are on your way to increased traffic and sales. About The Author: Cody West is a co-founder at Assisted Reach and an analytics and SEO aficionado. He counters his bad posture with yoga and is a fan of corny jokes. When it comes to data analysis, he “Excels.” You can connect with him on Twitter or via LinkedIn.